FAQ: Is it possible to add Bing basemaps to ArcGIS Pro? Yes, it is possible to add Bing basemaps to ArcGIS Pro. However, to use Bing basemaps, users must obtain a Bing Maps Key. Refer to the following link for more information on obtaining a Bing Maps Key, Microsoft: Getting a Bing Maps Key. For additional information on Microsoft Bing Maps Keys, email bing4esri@microsoft.com to get in touch with a Microsoft representative. To access Bing basemaps in ArcGIS Pro, first add the Bing Maps Key to the ArcGIS Online Organization. Refer to the following article for more information on how to add the Bing Maps Key and how to add Bing basemaps to an ArcGIS Online organizational account, ArcGIS Resources: Using Bing basemaps in ArcGIS Online. Bing basemaps must be added to a group and shared with an ArcGIS Online organizational account. 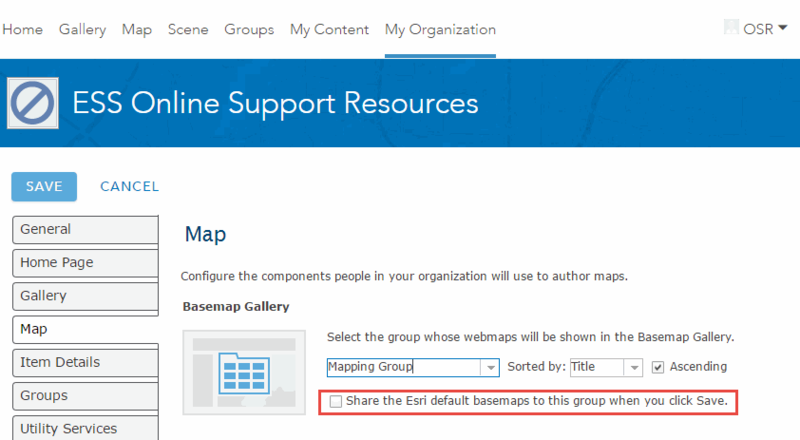 Refer to the instructions below on how to add Bing basemaps to a group and share the basemaps to an organization. 1. Create a new group. Refer to the following link on creating groups in ArcGIS Online, ArcGIS Online Help: Create groups. 3. Navigate to My Organization, and select 'Edit Settings'. In the 'Edit Settings' menu, select Map and navigate to Basemap Gallery. 5. Click Save. The Bing basemaps are now present in the ArcGIS Pro Basemap gallery. GeoNet: Is it possible to add Bing Basemaps in ArcGIS Pro?